Lacks room temperature monitor feature. Levana (the brand derives its name from a goddess of the same name in Roman mytholgy, who protects children, especially newborn infants) has been present in the baby monitors market for over a decade now. The brand has been associated with producing some of the best baby monitors over the years, and continues to feature in most of the top ten lists of baby monitors every year. Levana’s sole focus is on developing the most parent-friendly baby monitors and as such, their product range involves every kind of baby monitor imaginable (audio/video, movement monitors and complete baby monitoring systems) that modern parents seek for. 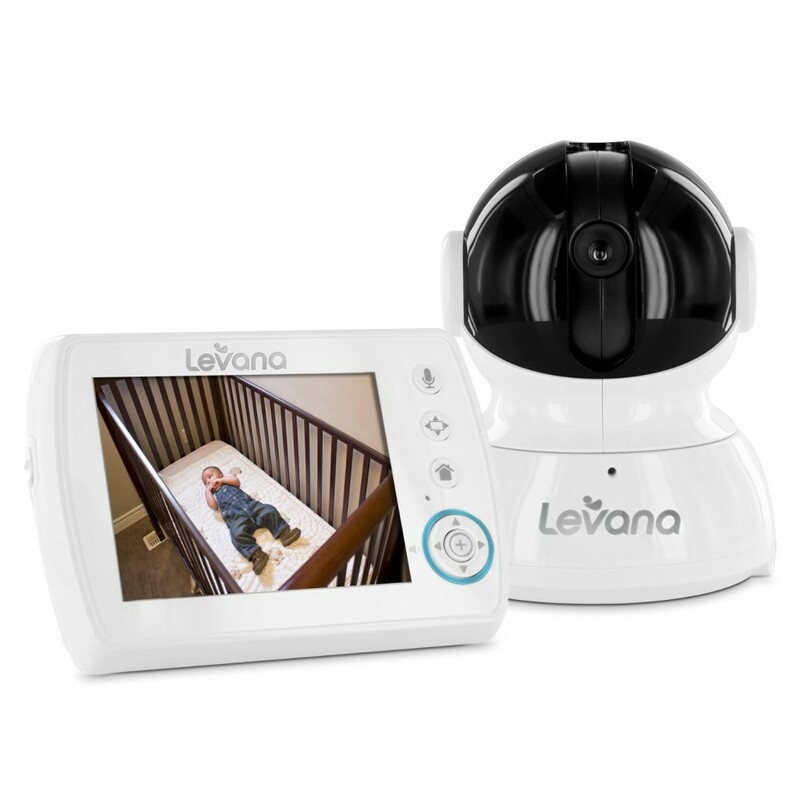 The new Astra Digital Baby Video Monitor with Talk to Baby Intercom, is another welcome addition to the ever growing range of baby monitors by Levana. The Astra baby video monitor, is being touted as Levana’s Big Star (literal as well as symbolic meaning), and is aimed at parents looking for a reliable baby monitor sans the need for recharging every few hours. A closer look at the device is provided in our detailed Levana Astra review below. 1) Fully Secure ClearVu Digital Signal – The Levana Astra’s ClearVu technology enables you to enjoy an outstandingly clear and precise view of your baby, up to a distance of 750 ft away. The completely secure and private digital signal of the Astra ensures that no body can hack intentionally/unintentionally into your personal video feed. There is no possibility of any interference with any public or private Wi-Fi networks as well, providing a completely interference-free digital signal for an uninterrupted video footage. 2) Smooth and Quiet Pan/Tilt/Zoom Camera Control – An essential feature of the Astra is its ability to remote control the video camera and provide a detailed and all-round view of the entire room, without making so much as a whirring noise. Using the camera you can get an uninhibited 300 degrees horizontal and 110 degrees vertical view of your baby’s room. The pan and tilt feature of the camera works very smoothly and there is no risk of waking up your baby, while you try to rotate the camera’s angle. There is a very helpful 2x zoom feature built in the camera too, which allows you to soak in a more detailed view of the area near your baby’s crib, if required. What’s more is that the camera is completely detachable and can be installed anywhere. However, it does require its own AC adapter cord to remain functional. 3) 48-hour Battery Life – The Levana Astra is capable of providing an extraordinary 48 hours of battery life, thanks to its innovative PEEP (Power On/Off Energy Efficient Picture) feature. The PEEP function sets the device in a sleep mode when it detects no motion or sound in its vicinity, thus saving precious battery life. This technology is voice-activated, so even if your baby makes the slightest noise, the camera jumps back into action, providing you with the live, continuous feed. Even without the PEEP mode on, the Astra still delivers a better than average battery backup of 10 hours, (thanks to its cell-phone like Li-ion batteries) with a continuous audio/video coverage. 4) Talk to Baby Two-way Communication – The Talk to Baby communication feature allows you to interact with your baby letting him/her know that you are close by. While this brings peace of mind to both parents and their babies, the two-way intercom can also serve as a handy tool for parents to remain in contact with each other and call for help as and when required. There are four volume level control settings provided on the Astra, and a silent mode to completely turn off the audio in the baby monitor. 5) Infra-Red Night Vision – Invisible Infra-Red LEDs built into the camera provide a clear view of your baby’s room from as far as 12 ft away in utter darkness. Instead of the normal red LEDs found on the more traditional baby monitors, the Astra features invisible Infra-Red LEDs, which will not distract or disturb your baby’s sleep when being used at night. Along with the noiseless camera operation, the Infra Red night vision makes the video camera ideal for using at night without waking up the baby. 6) Smart LED Indicator – The Levana Astra has a smart LED feature that gets activated as soon as the baby starts crying, and the light on the video screen turns from blue to a more ominous flashing orange and green colour. The sensitivity levels of the LED indicator can be set at a desired level, so that a random, slight noise does not wake up the monitor screen or you from your precious sleep. The Smart LED indicator continues to provide a detailed reading of the noise in your baby’s nursery, even if the volume level is turned down at your end. 7) Additional Features – The Levana Astra is equipped with a large 3.5″ TFT-LCD colour screen which offers a great video quality both in daylight (in colour) and at night (in black and white). Also, there are 3 lullabies built in to the Astra that are remote activated and can be changed using the parent unit, to help your baby to sleep if he/she is accustomed to the listening to lullabies before bed. The Levana Astra is an expandable system which allows adding up to three more cameras to cover four rooms simultaneously and displaying them on a single screen. The Levana Astra is a quality product, with an affordable price tag and almost all the essential features that one may look for in baby monitors. Currently priced at $149.99 on Amazon, the Astra goes a long way in satisfying the concerns of parents when it comes to monitoring their babies, without sacrificing on their usual routine life. However, if you want a perfect baby video monitor, (equipped with room temperature sensors and whatnot), and are not afraid to shell a few extra bucks, you can give the Levana Ayden or the DXR8 from Infant Optics a try.